Bob and I usually stay in on Valentine's Day and make a special dinner together. This year we decided to make this Garlicky Shrimp Pasta that we've been eyeing for a long time. This was a simple, quick dinner that was every bit as good as it sounds. 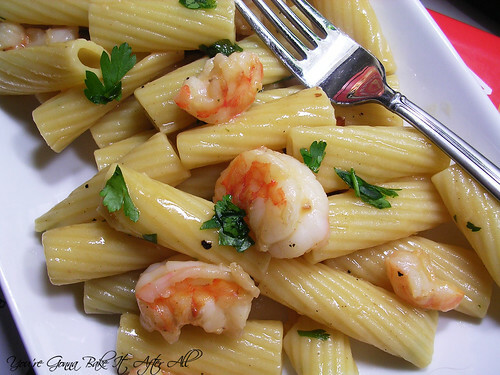 I'm glad to add another shrimp pasta to our dinner repertoire! 1. Toss 2 teaspoons minced garlic, shrimp, 1 tablespoon oil, and 1/4 teaspoon salt in a medium bowl. Allow shrimp to marinate at room temperature for 20 minutes. 2. Heat 4 smashed garlic cloves and remaining 2 tablespoons oil in a 12-inch skillet over medium-low heat, stirring occasionally, until garlic is light golden brown, 4 to 7 minutes. Remove skillet from heat and use a slotted spoon to remove garlic from skillet; discard garlic. Set skillet aside. 3. Bring 4 quarts of water to boil in large Dutch oven over high heat. Add 1 tablespoon salt and pasta. Cook until just al dente, then drain pasta, reserving 1/4 cup cooking water, and transfer pasta back to Dutch oven. 4. While pasta cooks, return the skillet with oil to medium heat; add the shrimp with marinade to the skillet in a single layer. Cook the shrimp, undisturbed, until oil starts to bubble gently, 1 to 2 minutes. Stir the shrimp and continue to cook until almost cooked through, about 1 minute longer. Using slotted spoon, transfer shrimp to medium bowl. 5. Add the remaining 3 teaspoons minced garlic and pepper flakes to the skillet and cook until fragrant, about 1 minute. Add the flour and cook, stirring constantly, for 1 minute; stir in vermouth and cook for 1 minute. Add clam juice (or vegetable stock) and parsley; cook until mixture starts to thicken, 1 to 2 minutes. 6. Off heat, whisk in the butter and lemon juice. Add the shrimp and sauce to the pasta, adding reserved cooking water if sauce is too thick. Season with black pepper. Serve, passing lemon wedges separately. I love dishes like this. We stayed in and cooked for Valentines Day too. 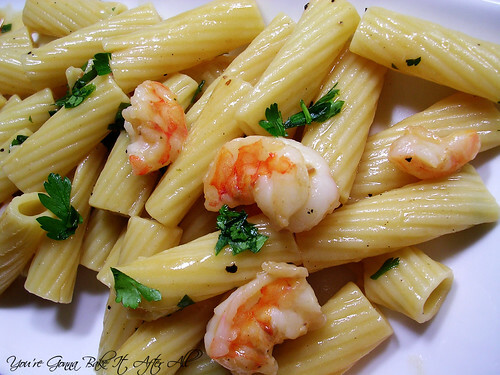 Shrimp is one of my favorite foods....I would LOVE this pasta. This sounds like my ideal restaurant dish, well done!